"Looking for a low-carb dinner to satisfies your Italian food craving? Look no further! 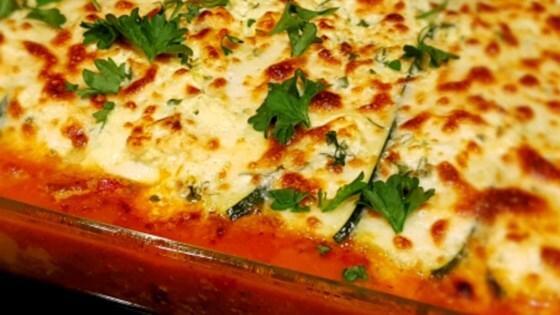 This lasagna is perfect in the summer with your garden-fresh veggies and herbs, or in the winter when you need a comforting meal. You won't even miss the noodles in this one!" Preheat oven to 325 degrees F (165 degrees C). Grease a deep 9x13 inch baking pan. Slice zucchini lengthwise into very thin slices. Sprinkle slices lightly with salt; set aside to drain in a colander. To prepare the meat sauce, cook and stir ground beef and black pepper in a large skillet over medium high heat for 5 minutes. Add in green pepper and onion; cook and stir until meat is no longer pink. Stir in tomato paste, tomato sauce, wine, basil, and oregano, adding a small amount of hot water if sauce is too thick. Bring to a boil; reduce heat and simmer sauce for about 20 minutes, stirring frequently. To assemble lasagna, spread 1/2 of the meat sauce into the bottom of prepared pan. Then layer 1/2 the zucchini slices, 1/2 the ricotta mixture, all of the spinach, followed by all of the mushrooms, then 1/2 the mozzarella cheese. Repeat by layering the remaining meat sauce, zucchini slices, ricotta mixture, and mozzarella. Spread Parmesan cheese evenly over the top; cover with foil. The lasagna can be assembled a day ahead and refrigerated until ready to bake. You may need to lengthen baking time.